If you think this location looks familiar, it is because Kaw Kaw burger was supposed to have opened here. 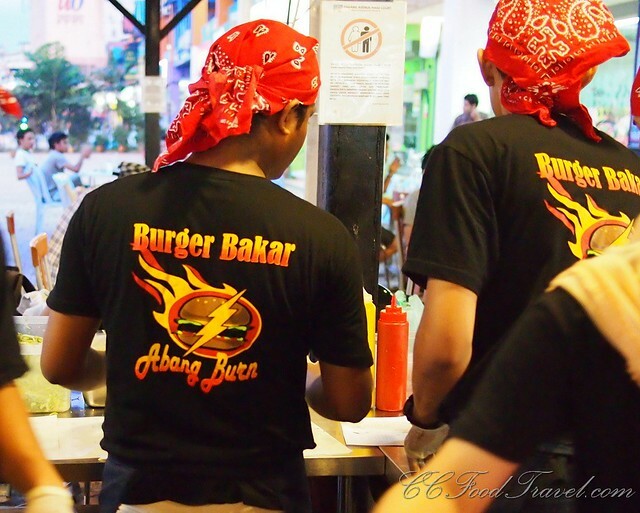 However, Burger Bakar Abang Burn now stands in the same location. 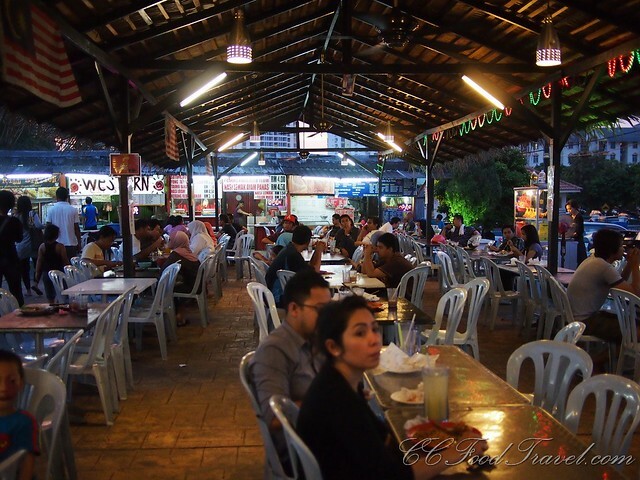 Since we were in that part of town (our foot and body masseurs are located nearby you see) we decided to check out this food court in Ampang that looked already packed with people. Abang Burn @ Mohd Bakar hails form Pangkor Island and he used to be a butcher in Australia before returning home to Malaysia. He then decided, why not make his own burgers, for the masses to enjoy. Abang Burn has long been a fan of steak, so his burgers are made employing steak sauce and mayo that he formulated himself. We would soon find out, just how good his burgers were. See the young men slaving over the stoves. 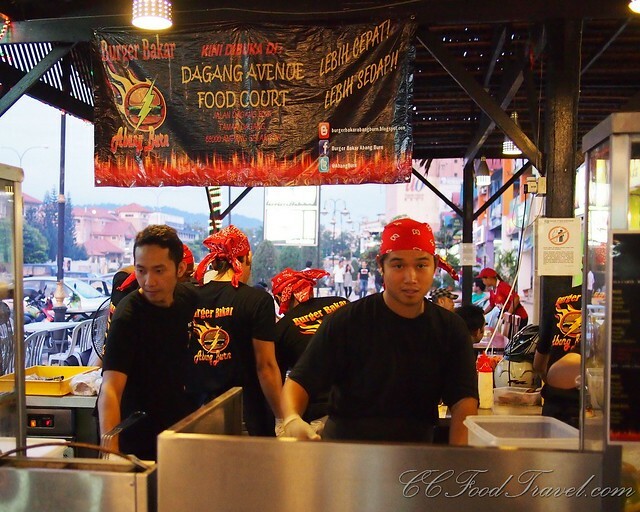 Well, the high number of staff at Burger Burn are for a good reason. 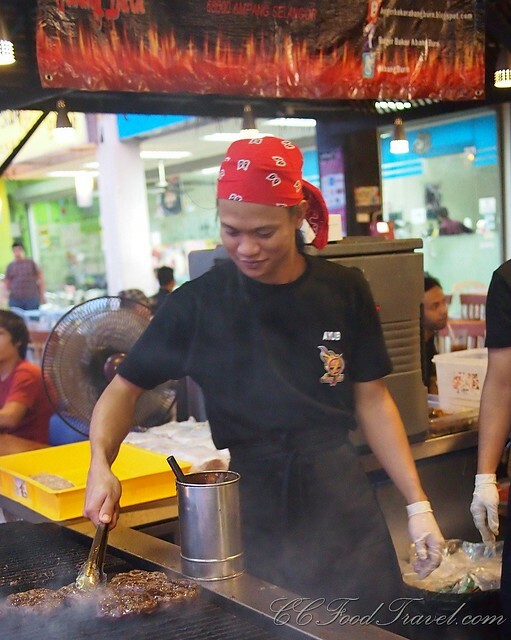 You see, these guys work efficiently and quickly, and eventhough the queue for the burger is long, their promise is that you will get your burgers within 10 -15 minutes upon ordering. Ours came in 8 minutes.. so, not bad at all! And how were the burgers? Well mine was the single chicken burger with cheese (RM8.50 – can’t eat too much before getting a body massage, you know..) and Cumi had the beef burger straight up (RM7.50). If you add one dollar, it becomes the set and you get 3 sausages with that. It’s a pretty good deal but we couldn’t eat too much for the reasons I mentioned earlier. No matter, we will be back for the specials soon. My chicken burger was pretty good – the skin was super crunchy and the chicken was more like a chicken breast than processed chicken patty. 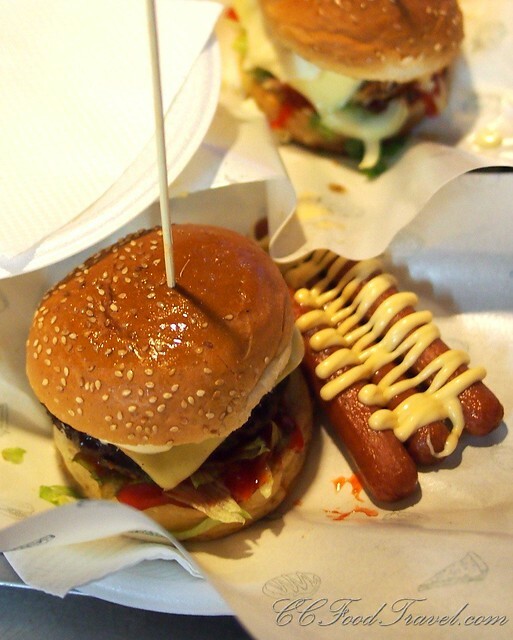 Cumi’s beef burger was OK – according to him, he would have preferred more of a bite to the meat patty. The patty was too ground up for his liking. Be prepared to get sloppy because the deceivingly neat and ‘dry’ looking burger, is drenched in sauces on the inside. Midway into my burger and I’m practically licking the sauce off my fingers and hands. L – Chicken burger : more like fried chicken breast, with cheese – i liked the fact that it was not a patty. R- Cumi’s beef burger, tasty and freshly ground but perhaps ground up too much! Previous articleWin a Tropical Island Holiday! Pangkor Laut Resort, 3days 2nights holiday! 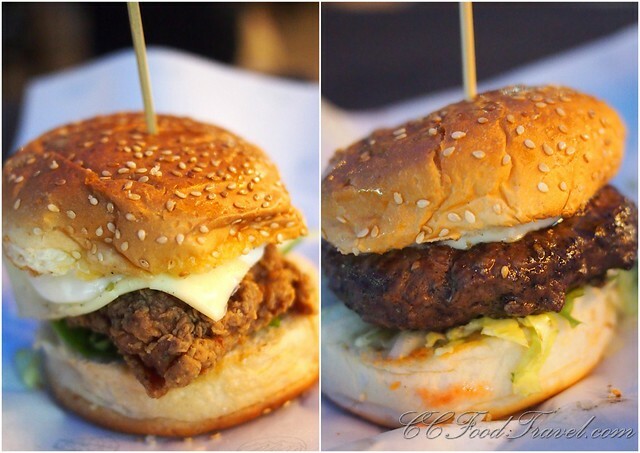 recently heard all nice burger come from kl side…any good one at PJ site…will try this soon..is the food selling malay food only?